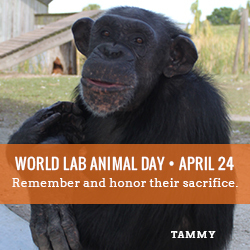 Just learned that today is World Lab Animal Day. What a sad world I live in that there is such think at World Lab Animal Day. If you’ve been reading my blog for a while, you know how deeply I feel about animal welfare. I do not think we’re all that special that countless lives may be sacrificed so we can find new ways of healing ourselves. What we are is really good with weapons. And we’re bigger. And we are amoral. And very fond of ourselves too. We think so highly of ourselves we don’t even flinch at the suffering, the torture we inflict on lab animals every day. Being accepted at graduate school was a big deal for me. It was the culmination of a life long dream and hard work. And yet, I took a whole year and a half between acceptance and start. Why? Because I would not settle for just any lab for my research. I would NOT do animal testing and that was final. Oh, there were many interesting lines of research, many good labs. But they all tested in animals. Rats, mice, monkeys, rabbits. Not a chance I would compromise my values. You can imagine how ecstatic I was when I found a lab that not only did amazing research, but they did it on human cells in culture! And! [for those who are in science] Because it was done in human cells, it was actually considered in vivo research instead of in vitro. Double win!